From your home’s exterior to its interior, you can play with paint color combinations and tones to create interesting and attractive spaces. The colors must “sing together … like a musical chord” as the great painter Henri Matisse theorized in his discussion of color use and the evolution of his palette. 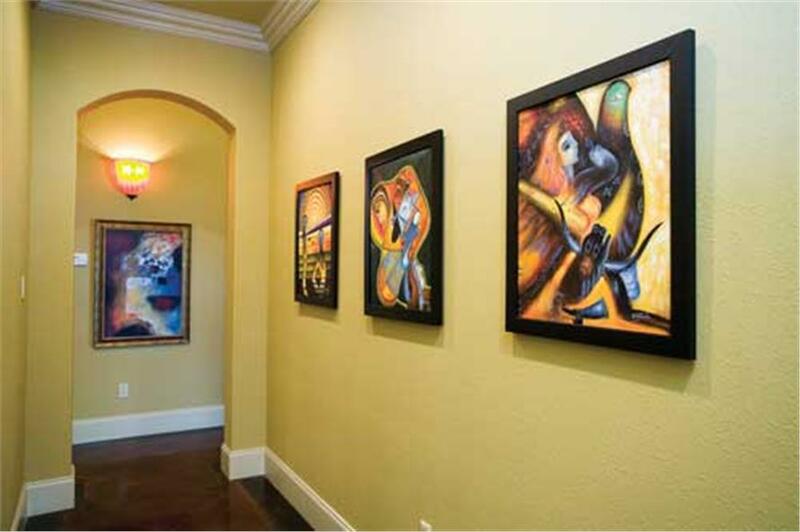 Just like Matisse, you can use amazing colors to make your home picture-perfect. Remember that the paint colors that you choose must work cohesively to create the feel and ambiance you want to emphasize in a particular space of the home. But before you grab that can of paint and your brushes, here are some helpful “dos and don’ts”. Do you want a paint color that’s soothing and calm in the master suite? 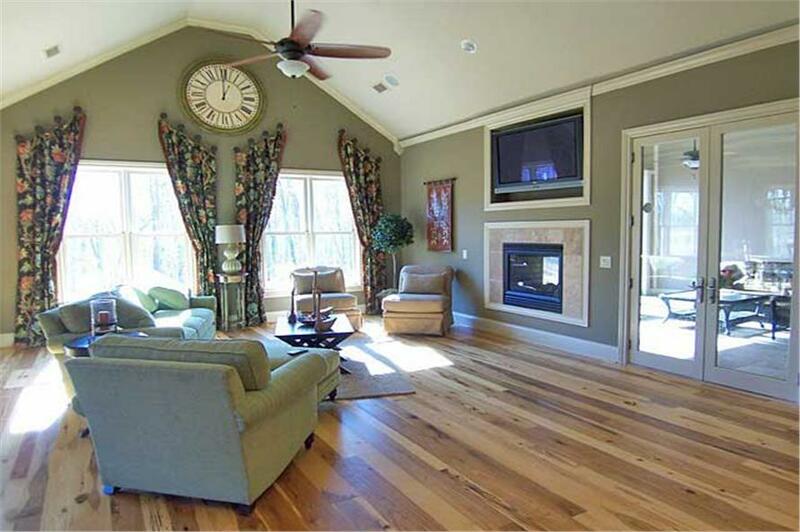 Comfortable and relaxing in the Great Room; and vibrant and alive in other areas? Then choose the paint colors that capture those moods. Left: The soothing green paint color in the Great Room of a 1-story, 6-bedroom Craftsman style home plan gives it a relaxed, homey, and cool feel (House Plan #163-1047). Right: A different shade of green trimmed with white makes the Great Room of this 2-story, 4-bedroom Country style home plan stylish and elegant (House Plan #120-2176). 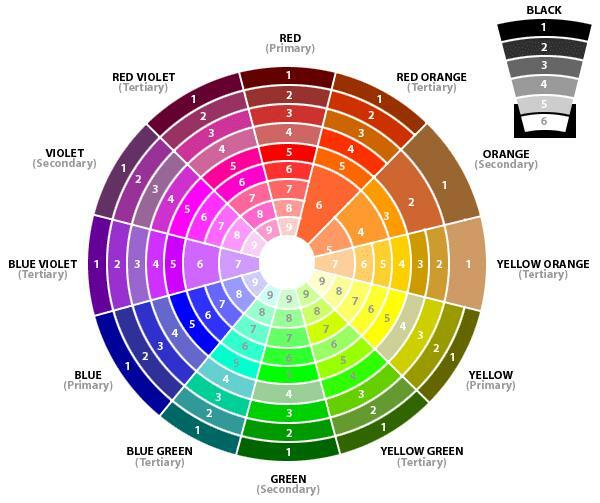 Let the color wheel guide your color scheme. Study it and find out how primary, secondary and tertiary colors relate to each other; and how you can create different moods - warm and cozy, cool, soothing, vibrant and energetic – by mixing colors. You can’t go wrong with your paint color selection if have basic knowledge of the color wheel and how a combination of the primary colors – blue, yellow and red – can produce interesting and exciting secondary and tertiary colors. Take a look at your furniture, decor, accents, and fixtures – and visualize a paint color that balances or ties everything in the floor plan together. Once that picture is clear in your mind, you can move ahead and select the paint color that complements the pieces and accessories in the room. Conversely, don’t paint the room and then try to select furniture to match its color. It’s much easier to put your furniture and decor in the room first than it is to paint the room a specific color – and then buy furnishings that work with the paint color. A mix of soft beiges and white paint provides just the right touch for the family room of a 2-story, 4-bedroom Country style home plan. The colors highlight the warm fireplace wall as well as the beige and brown furniture (House Plan #120-2176). The various shades of brown in the kitche/kitchen island area are highlighted by the off white paint color on the walls and ceiling (House Plan #120-2176). What may look perfect in the paint can or around the store may not work on your walls. 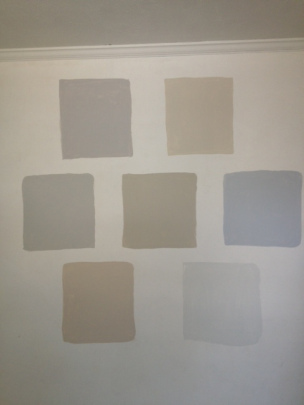 Experts advise testing the paint on a wall opposite windows to get a better picture of the color. Don’t be timid about asking for paint strips or sample-size paint jars to experiment with at home under various light conditions. 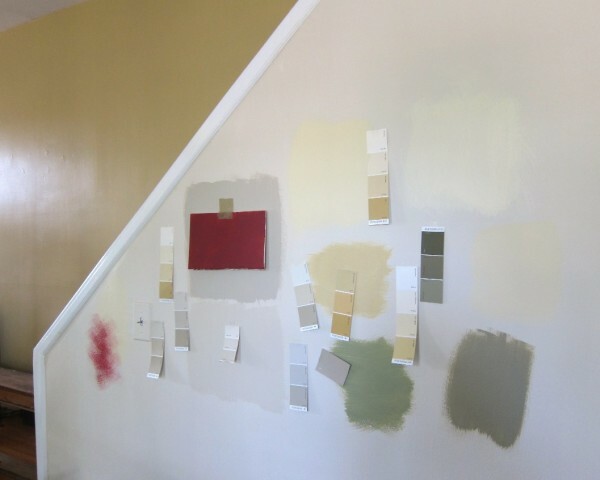 Pin paint strips and/or paint swatches on the wall (left), and allow the changing light to play with the colors you choose to test (right) in order to select the appropriate one. Think of your house as a painting on one huge canvas where everything is connected and makes sense. Don’t go from blue to pink to red. 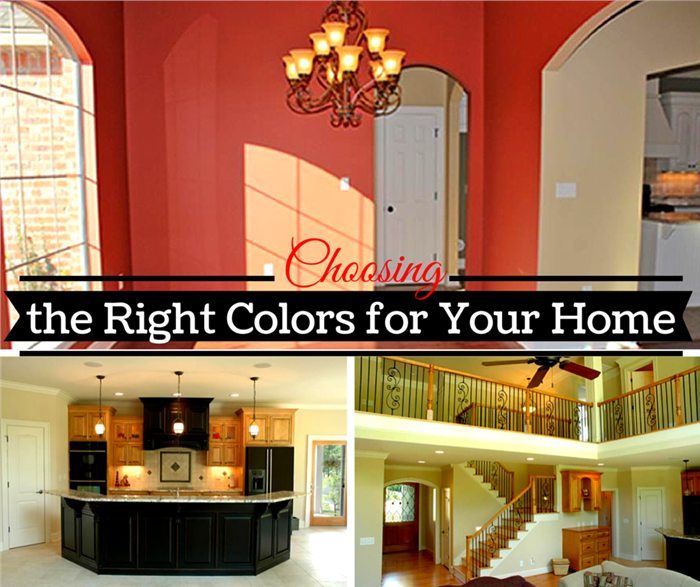 If you want a little variety in the interior spaces, select complementary colors or different shades of a color. Keep in mind that it’s one house and every room must flow smoothly into the other. Take a look at the flow of colors – yellow, blue, yellow orange – and the elements that connect the kitchen and dining area of this 2-story, 4-bedroom Craftsman style home plan. Glass windows with blue-trimmed panes match the ceiling; the yellow walls and a yellow-orange half wall that serves as divider have brown trim. 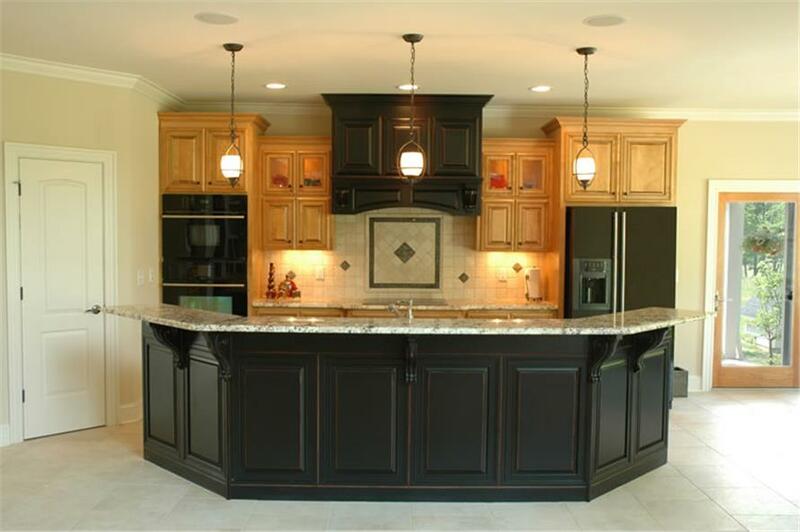 The kitchen fixtures and countertop complement the main colors of the space (House Plan #153-1781). 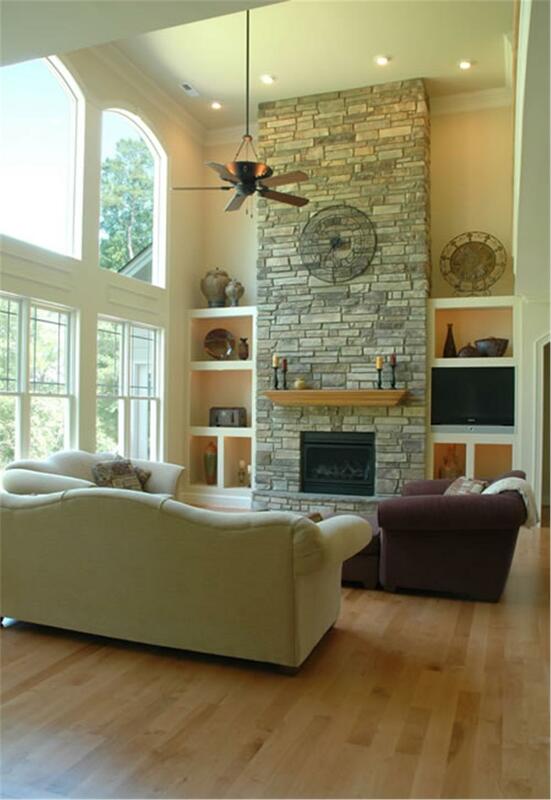 There are a number of features in a home floor plan that are of visual interest – a fireplace, stairs, or a door with a unique design. 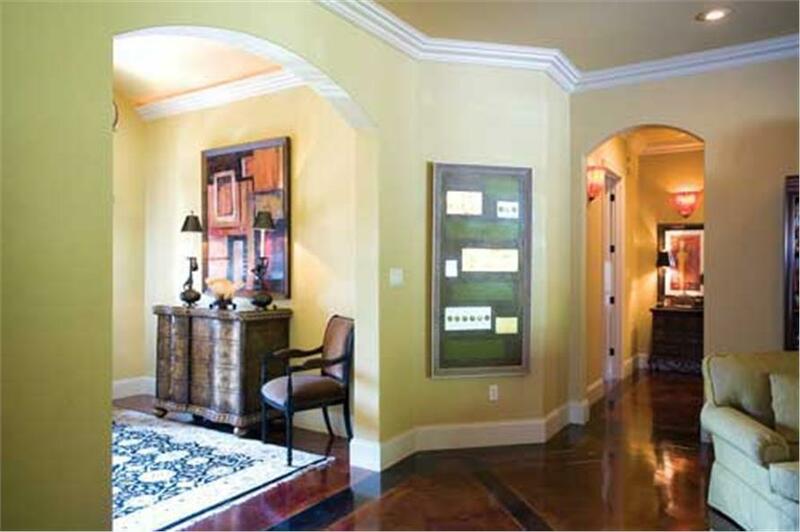 Draw attention to these features and transform them into focal points by using paint. As a rule of thumb, experts admonish homeowners to paint the focal point in bold colors like orange, vibrant blue, red, or purple to contrast it with neutral tones on the walls and furniture. 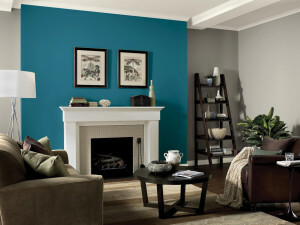 Walk into this room, and see how the dark turquoise wall draws the eye to the fireplace with its white mantel. The vibrant shade highlights the white and complements the neutral colors on the walls and ceiling. Shades of white, cream, gray, and black can be dramatic and offer more flexibility with accents and other touches. Experiment with bold paint colors, and give your home an exciting, vibrant, and interesting feel. But, don’t use a bold color in huge spaces like your living room. Temper it with neutral shades to create balance in the room. 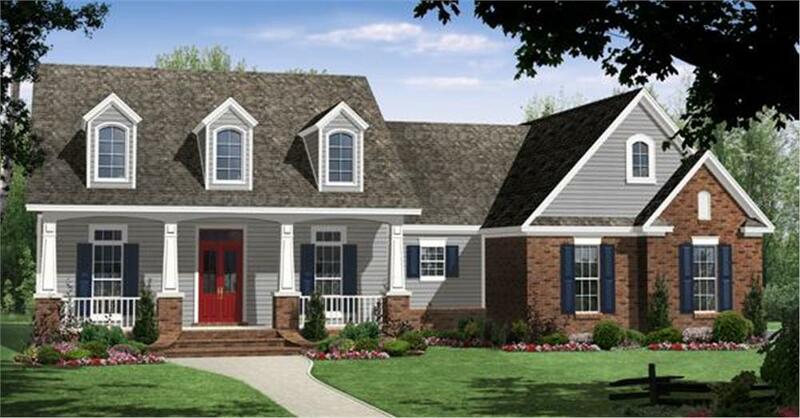 This eye-catching front door painted in a bright shade of red adds to the charm and curb appeal of a Ranch style home plan with 3 bedrooms (House Plan #141-1241). 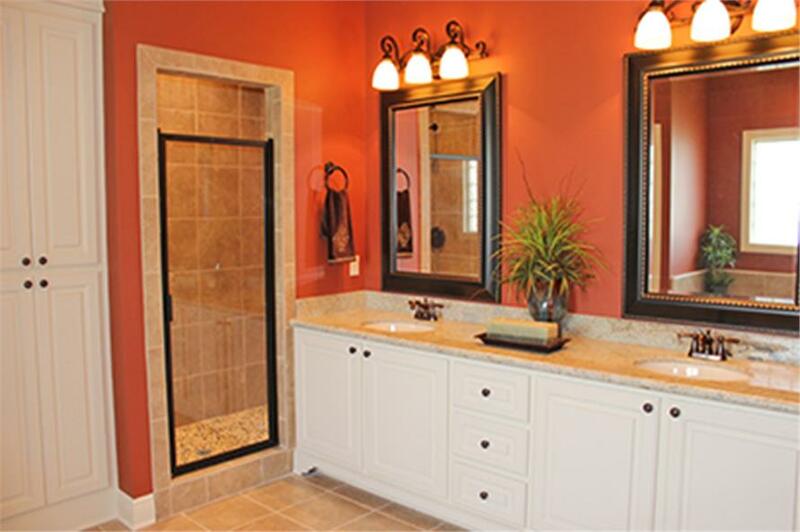 This orange wall in the bathroom of a 1-story, 3-bedroom Acadian style home plan is balanced with neutral shades – white cabinets, drawers; and taupe trims and floor tiles (House Plan #142-1090). Not too excited about bold colors but not thoroughly thrilled with just one color? 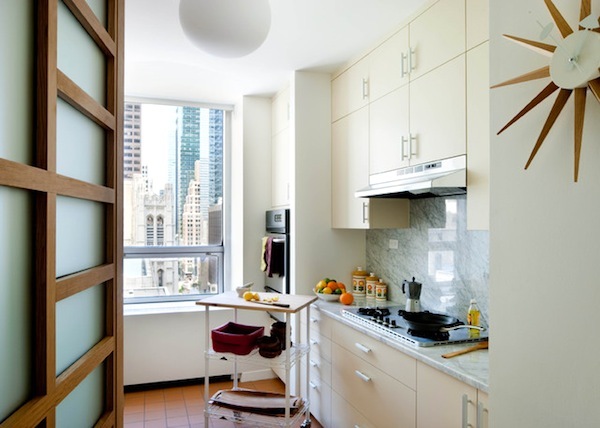 Why not try variations of one color – going from light to darker shades to enliven the space? Variations of green – from darker to lighter hues – brighten up the walls of this 2-story, 3-bedroom luxury European style home plan. In the lights, they seem to take on yellow tints (House Plan #153-1897). You can make a small space look bigger, brighter, and more open by painting the walls white, beige, or any pastel shade. These wall colors also make the ceiling seem higher. Another technique is to paint vertical and horizontal stripes in alternating light colors. 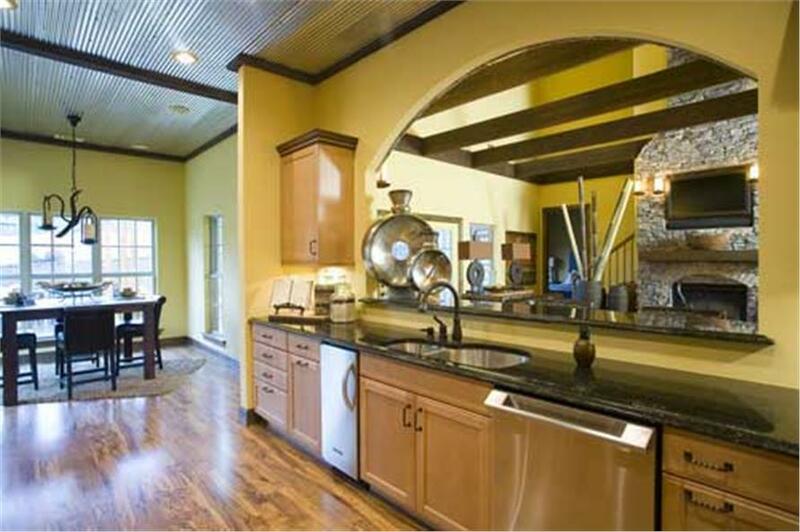 Create an illusion of space by painting small spaces in pastel shades, cream, or white as in this attractive kitchen. It’s your home, after all; and ultimately, it’s your opinion that matters. Are you ready to indulge your inner Matisse? Pick up those paint cans and brushes and have some fun as you start your painting adventure. Footnote: The top photograph in the lead image of this article is from a 1-story, 3-bedroom Acadian style house plan. 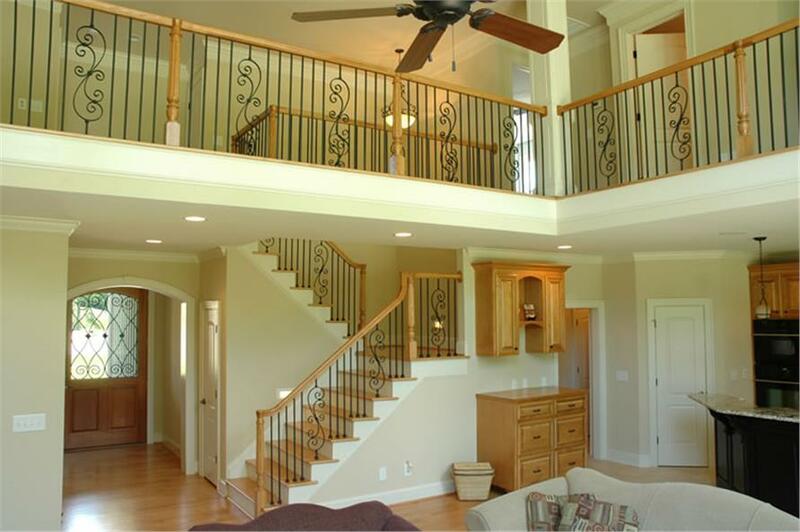 For more details, click here (Home Plan #142-1090).